Thomas Sowell writes that among the innumerable, varied and never-ending ideological crusades of the anointed a common pattern is discernible. Typical, a crusade begins when some substantial discrepancy is found between the world as they envision it and the world as it exists. To the anointed, it seems to follow, as the night follows the day, that reality must be brought into line with their vision. Logically, one might just as readily conclude that it is the theory which needs to be brought into line with reality. But that possibility is seldom given much consideration. The fact that reality has survived the test of time and experience, while the viability of their vision has yet to be proven in practice, is likewise seldom given much attention. Moreover, the process by which a society is to move from the existing situation to the situation desired by the anointed is seldom analyzed for its characteristics as a process. "I do not cry for a perfect man," Sen. Lindsey Graham said in his farewell to McCain. "I cry for a man who had honor and always was willing to admit to his imperfection." 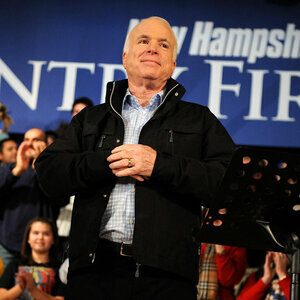 "If you want to help the country, be more like John McCain," the South Carolina Republican said, voice cracking. "I believe there is a little John McCain in all of us, and the little John McCain practiced by a lot of people can make this a really great nation." At the start of his farewell speech on the Senate floor, Graham stood next to his desk, surrounded by the empty desks of his colleagues, and looked anywhere but to his right, where McCain had sat during Senate debates before his death on Saturday at age 81. The space next to Graham was draped in a black cloth with a vase of white roses on top. Each time Graham looked down, he choked up again and fought back tears. "I do not cry for a perfect man," Graham said. "I cry for a man who had honor and always was willing to admit to his imperfection." Graham spent nearly 20 minutes joking about and embracing McCain's flaws as the seats around him started to fill in. Democrats and Republicans, including many members of the Senate Armed Services Committee that McCain once chaired, arrived to listen and support a visibly shaken colleague. The two Republicans shared a bond over their military backgrounds; both believed in the need for U.S. military intervention in foreign conflicts and grew close traveling the world together. They also logged many miles side by side on campaign buses, and Graham thanked the McCain family for adopting him into the clan. There were the bad dad jokes McCain liked to tell. The nicknames — like "Little Jerk" — McCain had for his colleagues. The famous hot temper. 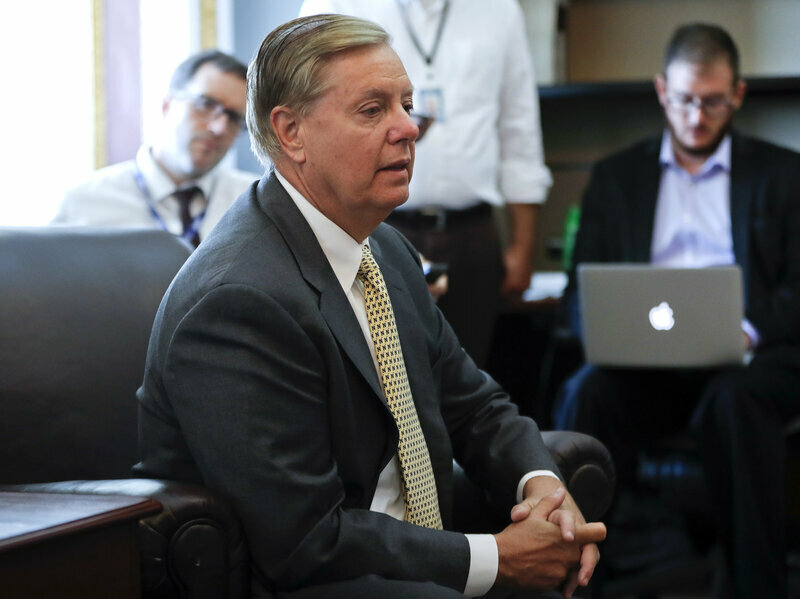 Graham also pointed out times when McCain's differences with his own party over policies turned into public clashes — all without mentioning the bad blood between McCain and President Trump that persisted even after McCain died. Instead, Graham mentioned his mentor's failed attempts at immigration reform, his belief in climate change and compromise. 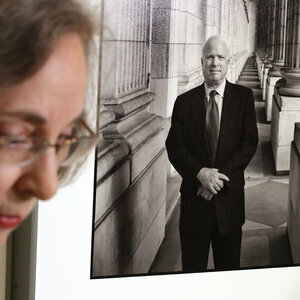 "He taught me that principle and compromise are not mutually exclusive," Graham said. "To my friends on the other side, as long as I'm here, I'm going to remember that you have to get something, too." Graham wanted to celebrate and acknowledge the mistakes his friend made during his long career because, he said, that's how McCain grew. "The reason we're talking about him today and the reason I'm crying is because he was successful in spite of his failures," Graham said. "He could be tough, but the joy that you receive from being with him will sustain you for a lifetime." By the time Graham was reading, and riffing, from a white legal pad with handwritten notes, he was in tears. As he left the floor, his colleagues lined up for hugs and handshakes or just tried to make him laugh. He later told reporters that McCain's widow, Cindy, called him afterward and gave him her approval. Thomas Sowell declares that piratical politics, of course, has many dimensions besides visions. However, some kinds of visions are more congenial to the political world. The prevailing vision of the anointed is particularly ill-suited. Anyone can see a “problem” before one's eyes and wish to “solve” it, or see an “unmet need” and wish to supply it. What is more difficult is to understand the implications of systemic causation within constrained options. The easier and more emotionally satisfying vision is clearly the vision of the anointed Politicians can more readily reduce it to slogans and images, and the media can more readily dramatize it. This is a bias inherent in the media, irrespective of the personal philosophies of print or broadcast journalists. Deceptive appearances have been with us long before the rise of the modern mass media. But never before have those appearances been able to reach so many people, with so much immediacy and so much seeming reality. The dangerous dramatizing of half-truths is the fatal talent of the television or movie camera. Even with honest and balanced people, that danger would be ever present, and would need to be constantly guarded against. With the media being overwhelmingly of one ideological bent, human bias and media bias only reinforce one another. Add to this the philosophy of advocacy journalism and the result can be what has been called “lying for justice”--which is to say, preempting other people's decisions by telling them only what leads to the conclusion desired. The White House has blocked an emergency effort to finish major U.S.-funded school, water and sewage projects in the West Bank and Gaza Strip, according to documents reviewed by NPR. It is the latest of a series of moves by the Trump administration to shut down U.S. aid to Palestinians, which is scheduled to end Feb 1. 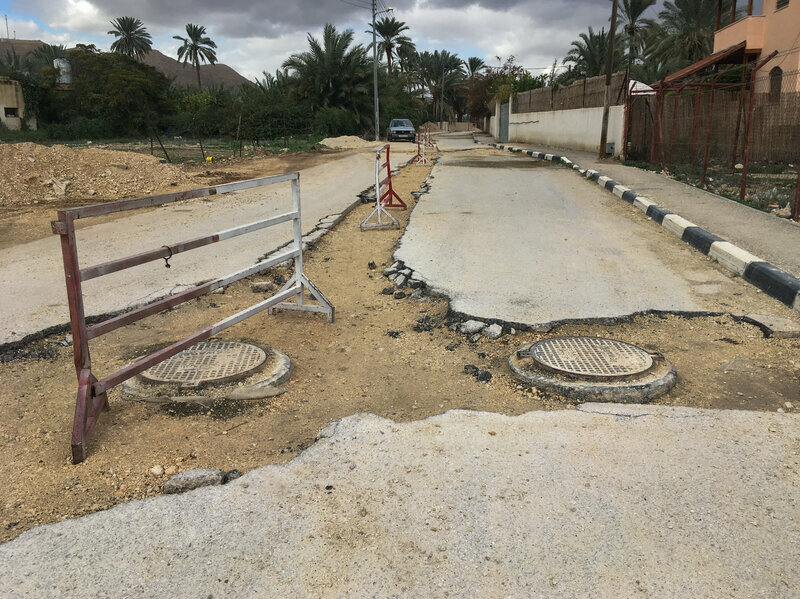 In the West Bank, a nearly complete multimillion-dollar sewage network in Jericho will have to be buried under asphalt and abandoned, and a $1.4 million school facility under construction in the Bethlehem area will be left behind, according to a recent document from the U.S. Agency for International Development. Anera, the U.S.-funded aid group carrying out the school project, recently received notification from the U.S. government that it may have to tear down the school, said Sean Carroll, the head of Anera. USAID, which oversees these projects, will lay off most of its local staff within months, U.S. officials say. They spoke on condition of anonymity because they were not authorized to speak about the matter publicly. "To abandon schools and water systems while in the midst of construction represents the worst instincts of this administration," said Dave Harden, who oversaw U.S. aid programs in the Palestinian territories under the Obama administration. "This peace team has no shame." 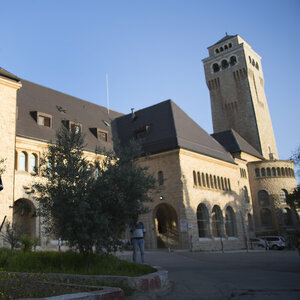 For years, the United States was the largest aid donor to the Palestinians, as part of a strategy to develop the Palestinian territories and help resolve the Israeli-Palestinian conflict. But in 2018, the U.S. slashed more than half a billion dollars in aid for Palestinians, in part to pressure Palestinian leaders to cooperate with the U.S. on a peace deal with Israel that President Trump promises to soon unveil. Palestinian leaders severed ties with the U.S. after the Trump administration recognized the contested city of Jerusalem as Israel's capital. After the aid cuts, there was still some assistance, about $30 million according to one official's estimate, being spent on projects started in previous years. But that remaining money was put in jeopardy with the Anti-Terrorism Clarification Act, which President Trump signed into law in October. Under the act, starting next month, if Palestinians receive U.S. aid, the Palestinian Authority could be compelled to pay millions of dollars in compensation to families of American victims of past Palestinian attacks. The Palestinian Authority rejects responsibility for attacks and says it fights terror. The authority has informed the U.S. that it will not accept aid money spent under these conditions, U.S. officials say. Scott Anderson, a former State Department attorney, wrote that "the Palestinian leadership has determined that the limited U.S. foreign assistance currently received is far outweighed by the potential liability to which they would be subjected if they were to accept it." By Feb. 1, the officials say all the government's aid programs for Palestinians will end. USAID officials spent months quietly seeking a workaround in order to save seven major Palestinian infrastructure projects from being abandoned: five water and sewage projects and two schools, government documents show. Aid officials drafted a request for the government to approve about $17 million in emergency funds for these projects, drawn from a pool of money labeled Development Assistance, which would be permitted under the anti-terrorism act. In a draft proposal, USAID officials argued that finishing these projects would "mitigate reputational and security risk to the U.S. government" and avoid "significant waste" of government investments in water and sewage systems already being built to serve tens of thousands of Palestinians. Abandoning these projects "could contribute to civil unrest in a community already experiencing major water shortages," USAID officials said in the proposal. 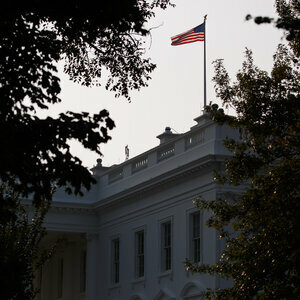 The White House rejected the funding proposal, according to an internal email from the National Security Council reviewed by NPR. The U.S. ambassador to Israel supported the proposal, so as not to leave the infrastructure projects unfinished, according to a U.S. official, who spoke on condition of anonymity to discuss conversations he was intimately involved in. The official said others in U.S. government agencies believe Jared Kushner, President Trump's point man for Israeli-Palestinian peace, was the one who blocked the initiative. A spokesman for Kushner did not immediately comment. 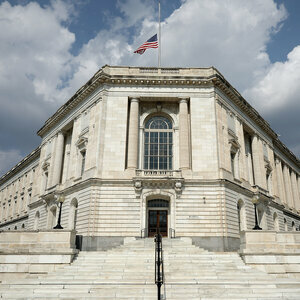 A tweak to the anti-terrorism act could permit Palestinian aid money to continue, but it is unlikely Congress would be able to amend the law before the funding cutoff goes into effect Feb 1. U.S. funding for the Palestinian Authority security forces, which help maintain public safety in the West Bank, could also be cut under the law. 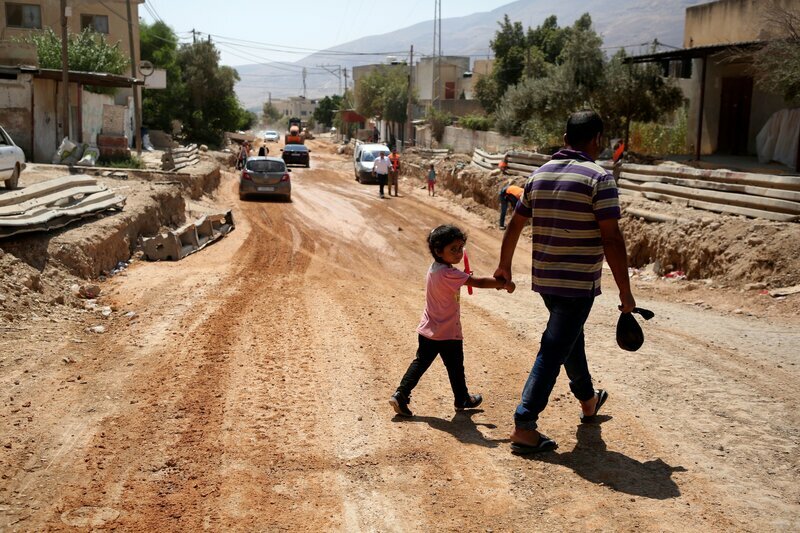 On Thursday, a USAID team drove over torn-up roads in the West Bank desert city of Jericho where they had installed pipelines to connect about 10,000 Palestinians' homes to a sewage treatment plant. "USAID Invests in Water Infrastructure," a colorful billboard reads. But this investment is likely to be abandoned. U.S. officials say they'll pave the dug-up roads to avoid hazards, leaving the unfinished sewage system hidden underneath. Jericho is in desperate need of the project, said Ehab Njoum, a municipal engineer. Only about 15 percent of the city is hooked up to a sewage treatment plant, he estimated. When most Palestinians in the city flush their toilets, the waste drops into private pits next to their homes. Sometimes these pits overflow, and there is a risk that untreated sewage can seep into and contaminate groundwater. 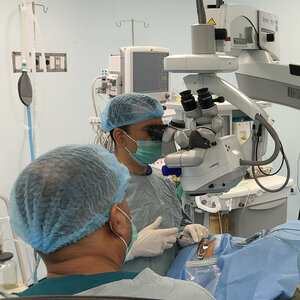 Jericho's Mayor Salem Ghrouf said he has never seen anything like what the U.S. is doing, "stopping funding for an important project like this one." Sowell warns that the full dangers of the vision of the anointed cannot reveal themselves immediately. Even the anointed themselves are currently under at least the residual influence of traditional philosophical, religions, and moral inhibitions. To the extent that their vision prevails and endures, however, successive generations of the anointed will be less and less under the influence of these eroding traditional constraints, and the pure logic of their vision can operate more fully. Conversely, among those not convinced of this vision's virtues, the spirit of resistance may well erode and the sense of outrage at its consequences become dulled by the accumulation of precedents for policies and actions that might once have been considered intolerable. In the anointed we find a whole class of supposedly “thinking people” who do remarkably little thinking about sustenance and a great deal of verbal expression. In order that this relatively small group of people can believe themselves wiser and nobler than the common herd, we have adopted policies which impose heavy costs on millions of other human beings, not only in taxes but also in lost jobs, social disintegration, and a loss of personal safety. Seldom have so few cost so much to so many. Washington (CNN) Her husband believes President Donald Trump's mental condition is deteriorating. Kellyanne Conway, Trump's top White House counselor, disagrees. "No, I don't share those concerns," she told reporters on Monday when questioned about her husband George Conway's weekend tweets calling into doubt Trump's mental state. It wasn't the first time the pair have split over Trump; George Conway has become an avid critic of the President on Twitter, even as his wife acts as one of his top television defenders. The divide has at times drawn Trump's ire -- "He's just trying to get publicity for himself," he told reporters in November -- yet the split persists. This weekend, as Trump was lobbing his own Twitter invective in all directions, George Conway responded with screengrabs showing the medical definitions of narcissistic personality disorder and antisocial personality disorder from the Diagnostic and Statistical Manual of Mental Disorders. "*All* Americans should be thinking seriously *now* about Trump's mental condition and psychological state, including and especially the media, Congress—and the Vice President and Cabinet," he wrote. On Sunday, he stated simply: "His condition is getting worse." Perhaps unsurprisingly, that sentiment was not repeated by the half of the Conway couple that works inside the White House. "I have four kids and I was getting them out of the house this morning to talk to the President about substance so I may not be up to speed on all of them (his tweets)," she told reporters on the White House North Lawn after appearing on Fox News. Trump himself has rebuffed mental health questions in the past. When questions about his acuity arose after author Michael Wolff published an account that depicted the President as unhinged, the President responded by calling himself a "very stable genius." Seeking to quiet the claims of mental decline, Trump also insisted his physician administer a cognitive exam during his annual physical in 2018. The doctor, White House physician Dr. Ronny Jackson, later told reporters he scored perfectly. Trump did not take the test this year, at least according to a readout of his physical from his doctor. 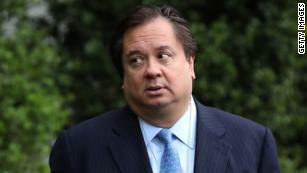 She didn't go further, though George Conway has said before that his wife does not appreciate the public Trump criticism he's taken to on Twitter. "I don't think she likes it," he told host Michael Isikoff on the Yahoo News podcast "Skullduggery" in November. "But I've told her, I don't like the administration, so it's even." He also noted they aren't the only Washington couple who disagree on politics. It wasn't always that way; George Conway, a conservative lawyer, was once under consideration for a top job in Trump's Justice Department. He later withdrew from consideration. In November, he helped co-found Checks and Balances, a group of conservative and libertarian lawyers who are critical of Trump's approach on legal and political institutions. And he's delighted liberals -- and enraged Trump supporters -- with his regular ripostes of the President on Twitter. He's been deeply critical of Trump's handling of the Justice Department, particular in the time when the President publicly fumed against his then-Attorney General Jeff Sessions. And he's offered periodic views of the ongoing investigation into whether members of Trump's campaign colluded with Russia during the 2016 presidential election. I believe that the American Empire has run its course. Our government has been taken over by a sociopath; every person in the Trump administration is afraid to speak up in defense of a dead war hero; most of the Trump appointments go from appointment to to Indictment; Third World corruption is a natural aspect of the United States government under Trump. If you don't have time to read the text--read the pictures and listen to the NPR comments. "If you don't have time to read the text--read the pictures and listen to the NPR comments." We Americans control the world, but we don't want to take the time to understand our power. We, in the main, like to see our selves as innocent. Thereby we are irresponsible and cannot understand "why they hate US. As we go into WWIII in the Middle East and Venezuela, we had better understand that reading is part of understanding. But they say we have a short attention span. Americans do not control the world. Some Americans would like to control the world. This will never be the case. Americans do not even control America, the American Government, or the American empire. When one third of the country reportedly supports a man who many experts in the field of psychiatry believe to be sick, and getting sicker...I believe intervention on behalf of the majority to be not only necessary for benefit of America but for the rest of the world’s security. The problem is not Trump per say, Trumpism is yet another example of how easy it is to subvert masses of ignorant people. Trumpism is proof of what we have argued since the early eighties, a decade after public education was scuttled post segregation. The US was no longer necessary to prop up as a counter to the Red Threat, making the American worker, voter, and MIC obsolete. The world does not need us, especially not the full third who rabidly support Trump. Are you afraid to ask for help? I certainly am not. In the early 1990s no one appeared to listen as we, Americans, called it as we knew it...Fascism, which has devolved into chaos under Trump. Now the world is listening, on edge, as a counter to both Trumpism and Fascism has begun to emerge. We shall see. Don't it always seem to go?